Business Ethics 8 Edition Packed with real-life examples of business decisions gone awry, the 8th Edition of BUSINESS ETHICS: CASE STUDIES AND SELECTED READINGS explores the complex issues of business ethics from the leaders' perspectives. This best-selling text offers a rare collection of readings which examines the business decision-making processes of many types of leaders, while revealing some of the common factors that push them over ethical lines they might not otherwise cross. 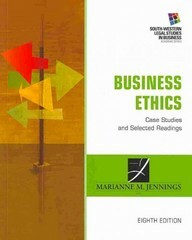 A combination of short and long cases, readings, hypothetical situations, and current ethical dilemmas, BUSINESS ETHICS: CASE STUDIES AND SELECTED READINGS provides a stimulating and thorough basis for evaluating business ethics, and encourages stronger values in future business leaders.